ok first off thanks for any and all help with my system!! 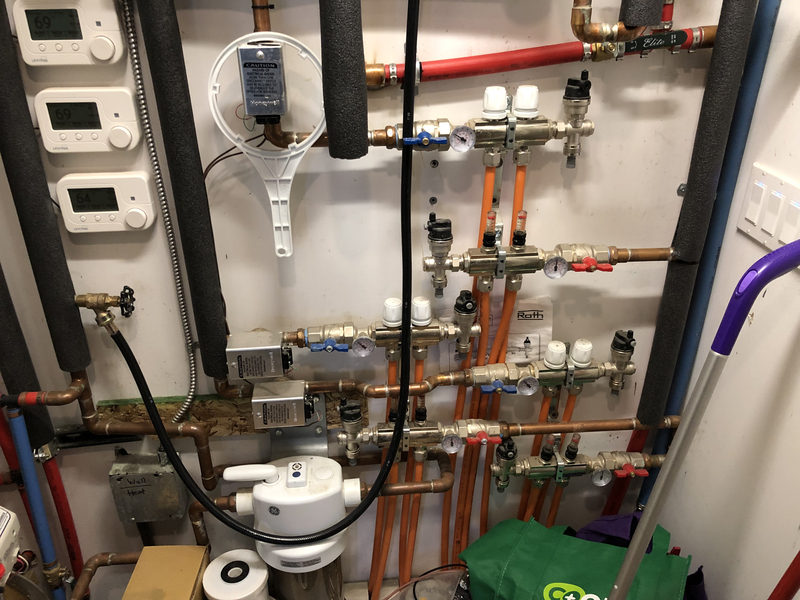 3 zone valves 3 stats although I have now made the living rm stat centrally located the 1 main stat for all 3 zone valves ( didn't lay in floor tubing correctly for separate zones. I have pictures before the concrete pour. 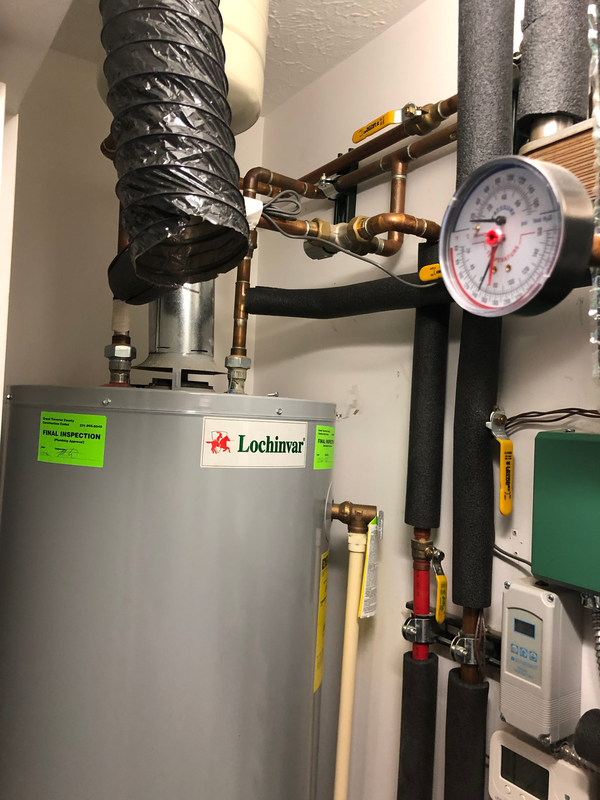 problem is I can't get the farthest 2 loops to make good heat, living stat at 70deg and the babies room is at 65-67 max wife is not happy with that for the baby! lol. 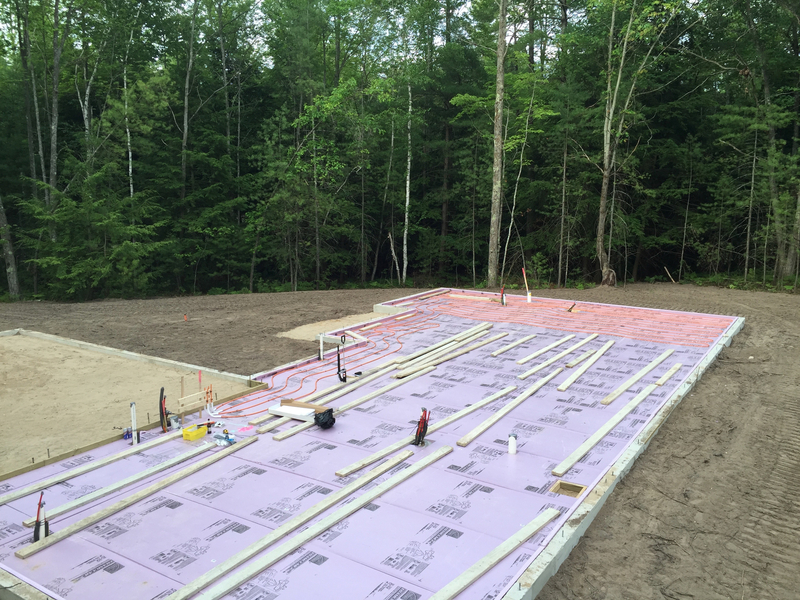 rooms are carpet with correct padding for radiant heat. rest of house is vinyl flooring. I know you guys will need more info but basically just looking to get some opinions on the system design if its way off or close to correct. Is the circulator a multi speed version, I would set it up a speed, sounds like you might not have enough pump for all zones and the plate HX? Are the two plate HX in series so flow always goes thru both? Kind of looks that way in the pic. If so that adds even more pressure drop. If your flow gauge readings are accurate that’s 9.5’ of head at 1.5 gpm to all zones. A 008 with a steeper curve for higher head applications might get you the flow you are looking for. The only sure way to size the circulator is to calculate your system head. To do this correctly you should have a design flow rate needed. no speed control but I do have a few of the grundfos UPS15-58FC I can try? yes they are in series with each other but are on the primary side of the floor heat loops. A 15-58 might get it on speed two, or three. Didn’t know you had them laying around. Worth a try since you have them. Start on speed 1 but I think that might be close to what you are getting with the 007. The 15-58 flange to flange is 1/8” bigger. Hopefully you can squeak it in the piping. what do I need to do to get a design flow rate? I'll give it a try! worst that can happen is I take it out. thanks! got the 15-58 in and the flow is better but still not .5gpm ill take it for now. I would like to get the correct pump in there though if its possible to figure the out. thanks for the help! Did you try speed three? You need to figure out what is the flow rate you need. 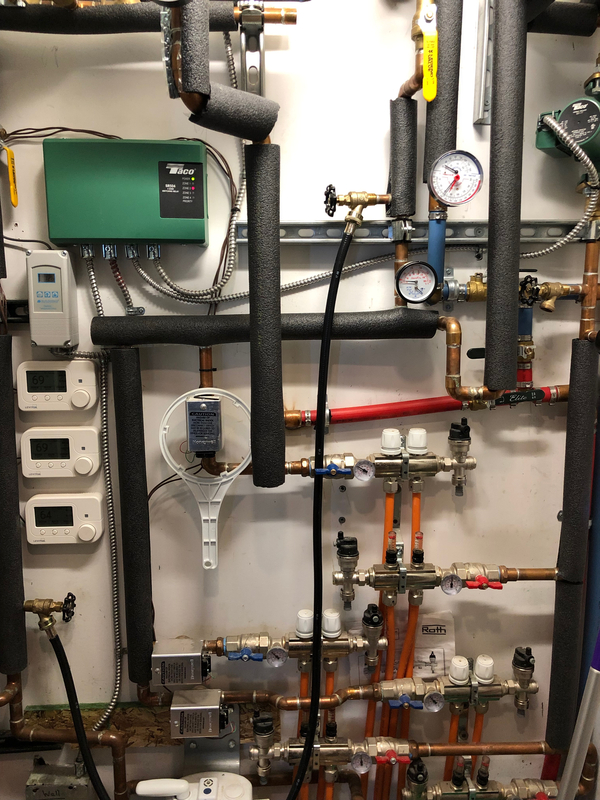 Then figure the head loss at the design flow rate of the longest loop plus piping, accessories, and equivalent length of fittings from the circulator, and back. And the heat exchangers head loss. Once you know that you find a pump where that head loss, and gallons per minute needed intersect on the pump curve. Preferably in the middle it. So throwing an example out. If you need .75 gpm on each loop. That's 6gpm for the main piping to the manifold. If the head loss at that flow rate is 11' then you would look on a pumps curve chart find 11 in the vertical head column to the left, and 6gpm in the bottom horizontal column. If those two points intersect in the middle of the pump curve. That's the one you want. 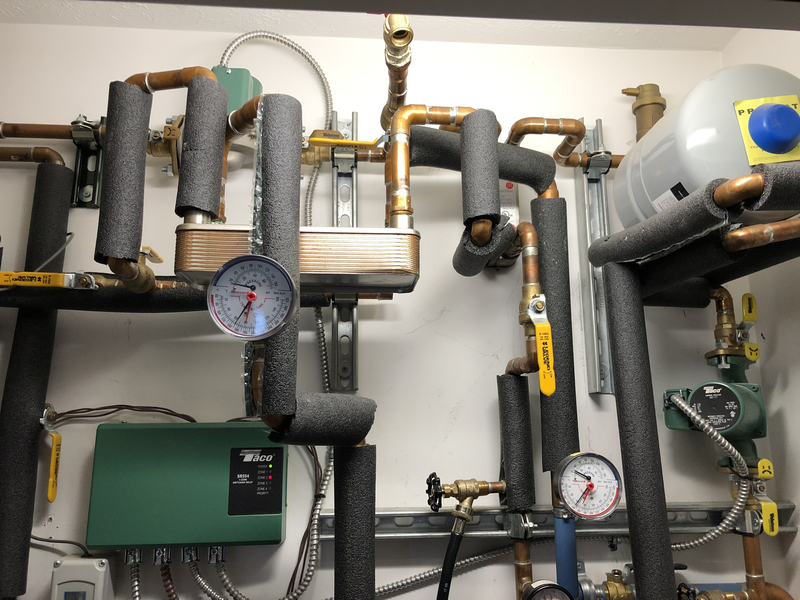 how do I figure out flow rate requirements? Did you try all speeds? You would need to know the heat loss for the zone you are trying to heat first. Typically by design we use 10 degree delta for radiant floors. So if the zone is 10000 btus with a 10 delta you would need to supply 2 gpm. If that zone has two loops the 2gpm would be divided by the number of loops. Now from there you would calculate the head loss for the system piping as stated above at that flow rate. rich_49 I questioned that too but according to the manual as long as the pressure is above 20psi it can be in that position, my well is at around 40-60psi so should be good. picture represents the 2 loops for the bedrooms/bath and part of the living room. You are correct if pressure is maintained at 20 psi. But it still likes to trap air. If you are getting .5 to loops I'd wait to see how it works. It's a radiant panel in concrete? So it will take some time to adjust because of mass. .5 gpm is pretty typical of a well designed panel. Some times less which is not working for you. -5 deg last night. still 66 deg in those 2 rooms and 70 in the rest of the house. starting to think there is an insulation problem. Rich_49- that gauge is for the OWB loop which is an unpressurized system. The slab jnsulation looks solid, how about the envelope. 2x6 walls blown cellulose. 1"foam board exterior. R40 cellulose attic. stud seams caulked, insulated windows. I would say you are good on the envelope, and floor for insulation. educate me please or did you mean to say "would"?